A pediatric dentist is a dental specialist that specializes in the care of children, teenagers, and young adults. Although general dentists may call themselves a family dentist, a children’s dentist, or a kid’s dentist, only a pediatric dentist has undergone an extra two years of training to become a specialist. During this training, the dentist has extensive dental and hospital training to become an expert in the treatment of infants, children, adolescents and also patients with special healthcare needs. It is important to realize that children are not just small sized adults and as such have differing dental needs. 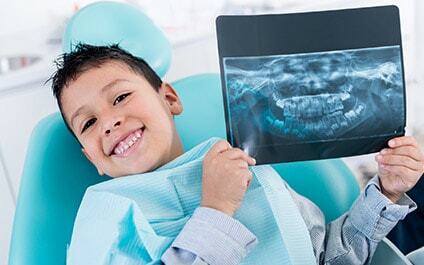 Pediatric dentists also look beyond just your child’s teeth and stress the importance of oral health as part of your child’s growth and development. This is why a pediatric dental office is more than just a children’s dentist office, it is a dental home. How do I become a Pediatric Dentist? In addition, some pediatric dentists elect to complete their board certification in pediatric dentistry. This requires successful completion of the written board examination and then completion of the oral board exam. Only by successfully completing both parts of the American Board of Pediatric Dentistry, may a dentist state that they are a board certified pediatric dentist. What Treatments do Pediatric Dentists Provide? It may be appropriate for your child to see a general dentist. General dentists are able to perform treatment and examinations on kids. This is similar to having your child see a family physician instead of a pediatrician. However, sometimes your child needs a dentist that is an expert in the care of children. This is when it is important to see a pediatric dentist. Reasons include high risk for cavities, extensive dental needs, crowding of teeth, concerns over medical needs, concerns regarding dental habits such as thumb sucking or pacifier use. Previous Previous post: Anesthesia and Children: Is it safe for developing brains?